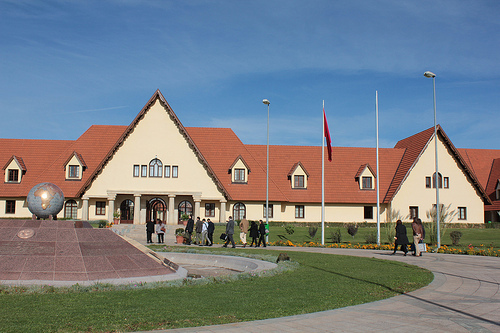 This opinion piece by Fatiha Al-Daoudi responds to the Ministry of Higher Education's decision to end Morocco's historic commitment to tuition-free university education. The move, announced at the end of July, met criticism from almost all fronts, forcing Minister of Higher Education Lahcen Daoudi to 'clarify' that only wealthy Moroccan families would be forced to pay. Here is a translation of the article followed by commentary. The original article was published in Hespress on August 4. How Free is 'Free' in Morocco's Higher Education? After the Minister of Education announced the end to free higher education in Morocco, politicians, unions and civil society organizations raised their voices in protest and condemnation of this daring infringement of a sacred right: the right to free higher education. This uproar forced Mr. Daoudi back in front of cameras to announce that middle class and lower class families' would be exempt from new tuition fees. This gave Moroccans cause to mention a phrase used at moments of demagoguery: Mr. Daoudi was forced to eat his words; so thank you, Mr. Minister. Returning to the topic at hand, a quick glance is all one needs to realize that free education in Morocco is just an illusion. First, preschools and daycare are not and have never been free. Rather, parents pay for this level of education. And as such, because having children has never and will never be limited to the wealthy, the middle and lower classes are forced to tolerate daycare and pre-school tuition because the state refuses to get involved. And now, what is the state of the public education compulsory for children between 6 and 15? Parents are tried of watching their sons and daughters be guinea pigs for different reforms that have made public schools more demagogical than pedagogical. Many people from different segments of society have resorted to private education, which, considering its weak oversight, isn't necessarily better than public education. And so they pay the necessary fees for primary and middle schools, even though some of their salaries are below minimum wage. Nonetheless, they sacrifice for their children. Maybe we ought to look at the High Commission for Planning's statistics about the percentage of families who send their children to these schools. Without a doubt, the numbers would surprise us to the point of questioning whether education is truly free at this level. So we're left with public high schools. These institutions are appreciated by mothers and fathers who can't afford fees for private schools - who, as we all know, continuously raise their prices. They are also valued by those unable to get into foreign schools, despite the willingness of some to stoop to any low to secure places for their children. In public high schools, families find themselves caught between teachers who are on strike, or constantly missing class, and the autocratic private sector. Then we arrive at higher education, which, despite being free carries a large price tag, so to speak. Higher education in Morocco has nearly been bled dry by the voluntary departure process, the result of irresponsible government policy. The best professors have deserted the system and those who remain, save those blessed by God, are needed desperately. Unfortunately, these professors have turned a blind eye to the "copy and paste" plagiarism plague that has infected our universities and students. Universities also suffer from absenteeism. Professors prefer to spend their time making money on the side, rather than teaching, their fundamental responsibility and what their salaries are meant for. Instead there are some that are so despicable they don't show up on exam day. Furthermore, enrollment in doctoral studies in Morocco has become riddled with difficulties. To enter a program, you must first satisfy guidelines that are so intense they've made mere acceptance a goal in itself, while neglecting one's ability to carry out scholarly research. This is an obstacle to scholarly research's development. And as such, whether it were free or not, higher education in Morocco is suffering in a state of large-scale decay. This dismal reality is exacerbated by high school graduates who enter the university system with poor understandings of both Arabic and French. As a result, they are unable to adapt easily to the demands of work in today's world. Perhaps requiring tuition fees will help to fund new academic buildings or to repair existing ones. But will this improve the quality of education? It's unlikely. Improving quality requires a strict review of professors and procedures to encourage top performers while penalizing those who fail to sincerely fulfill their duty. The results of a such a review should also be made public. Similarly, university administrations, by and large hidden behind their status, need to be held accountable. Currently, they are like employees looking to avoid their obligations and so move from one strike to another, leaving their institutions ineffective and sputtering. As for students, they should be charged with an honor code. Our universities should make this mandatory, as is done in other countries, so that students clearly know their rights and responsibilities. Tuition fees will not by any means improve the quality and performance of higher education, or the education system in general. That is because tuition already exists, practically speaking, and is paid by families beginning with preschool. Though, it brings no guarantee of quality. The basic premise of Ms. Daoudi's article is that despite the lack of tuition fees, public education in Morocco has always had its costs. This has been true since the beginning, either in the form of poorer facilities and resources or the debt incurred by the government in implementing and sustaining this policy. Those costs have increasingly been borne by families in recent decades as the quality of public education has declined. The education system's failures have forced more students to enroll in private schools which - despite their pricey tuition - can be no better than public institutions. In her descriptions of the various costs and shortcomings associated with Morocco's 'free' education system, Ms. Daoudi touched on several issues that I witnessed firsthand when I taught in Fes. Sidi Mohammed ben Abdellah University is a public university and is no stranger to a lack of resources, unmanageably large class sizes, and a general air of chaos - all of which impede learning. Cheating is endemic, and encouraged my professor's capricious and authoritarian attitudes when it comes to grading. My final semester was marked by a student strike incited by a professor who, for undisclosed reasons, gave all of his students zeroes. Professors, as Ms. Daoudi describes, should be blamed for this, as well as absenteeism and a general lack of professional ethics. Bribery and cronyism are not uncommon. To pass a class you may have to pay or provide 'services' for your professor, unless you have a relative in the Ministry who can help you from above. That said, I did work with some incredible, honest and dedicated professors. However, as Ms. Daoudi alludes to, these outstanding individuals are the exception. When I asked my students about how they would improve Morocco's education system, many of them mentioned tuition fees as a way to not only improve university resources but also to change students' approach to learning. Many complained that students don't take university very seriously because they don't have very much on the line. They noted that in America, where higher education is very expensive, students tend to take it much more seriously. Raising tuition fees is a step in the right direction, though doing so incrementally may backfire. In my understanding, wealthy Moroccans don't choose to study in Morocco, especially at the university level. Tuition fees may incentivise families to send their children to European universities. Now that medical school in Morocco will cost around 1 million Dirhams (90,600 Euro) and Engineering school anywhere from 400,000 to 600,000 Dirhams (36,200 - 54,400 Euro), those costs may be worth paying for a much higher quality and more reputable degree. Thank you for the article. I have a question though: is it possible for an international student (non-Moroccan) let's say a French, for example, or a European who speaks french, to come and study for free in Morocco?